Do you mean to tell me that summer is on the downside already? The first sign is the Alaska Baseball League season ending. 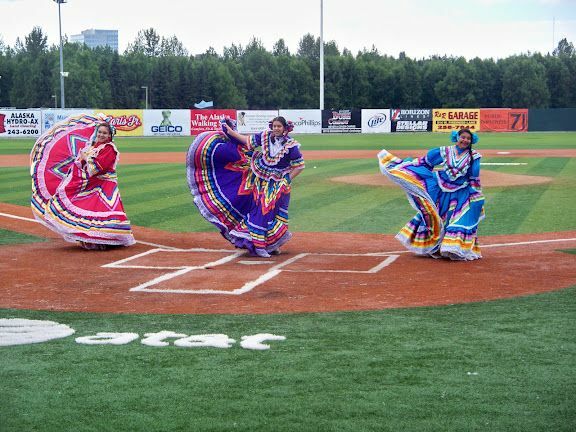 It was a colorful one, to be sure, and the Anchorage Bucs had theme nights including the Mexican night. The other big event of the summer in Anchorage is the Petroleum Club Golf Tournament, which has over 400 entries. It's a time for reunion of former oil execs, who have returned to their state of origin, but the amazing thing is that the children often decide to remain in Alaska and reap all the benefits of living here. On a personal basis, I have continued working as a 'travel concierge' and now as a 'relocation concierge' where I act as a hostess to welcome incoming fellows. Altho' this is my world, I don't mean to neglect writing about the many other outdoor activities going on. There are so many bicycle races, foot races, and biathalon competitions every weekend. The annual Mt. Marathon race in Seward was saddened by the loss of an older fellow. They never found him after he reached the top, and the search and rescue was given up after several weeks. The downtown merchants host a Block party with Fourth Avenue closed and a tent with a band, bar-be-cue, and margueritas at hand. The weather has not always cooperated, altho' the beautiful days are welcomed, and most activities go on, rain or shine. Why, they ask. . . well, this is Alaska, and we're tough. Sure! We recognize international holidays here, too. Our popular restauranteur, Jens - whose restaurant bears the same name - always brings in llamas and other livestock and bales of hay, to display under the tent outside his place, and there's costumed French notables, beheadings, carriage rides, and a loud New Orleans style band, etc. But that's not all that's going on in our city. We have downtown activity, too, with the Town Square becoming a poplar place for fairs and markets. It's a great drawing cards for our many tourists, who can walk to most of these place, but for the locals - well, me, anyhow - we would have preferred some parking available, not unlike Union Square. A tourist would think that the large parking garage within a block of this congested area would suffice, but they don't know that this garage is only for State of Alaska government employees. The State has more money (our money) and can afford this, plus taking over the large Ensearch Building, a beautiful 15 story edifice originally built by Texas trillionnaire, H. Hunt. Across the street is the new Dena'ina Convention Center, which is a 3 story marvel (this means it was built within budget). The name is interesting, and I prefer my pronounciation (dee-na-een-a) to 'theirs (de-nine-a). Okay, so I'm poking fun at my favorite city, but there are funnier stories I can relay here. For those getting out of town, we note the fishing is good if you're after halibut, but the salmon runs are down this summer. It's still a pleasure just to get out on the lakes, rivers, and inlet to try your luck, and I've been lucky to have friends supply me with enough salmon for the winter. But nothing tastes as good as a king salmon, never frozen, and gently sauteed. 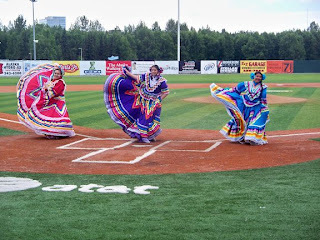 Baseball season is at the half way point, and scouts have already taken some of the Anchorage Bucs best pitchers, so we hope to struggle thru and maintain the top half of the board. We had a fun night recently called Mexican night and with it was a mariachi band, colorful Folklorico dancers, and margueritas. Of course, without a full liquor license, we had to fake it, with salt-rimmed glasses of Mike's hard lemonade - but it worked! Well, it's been a chilly July, but we're pretty tough up here, and the tourists I've talked to are glad to escape the heat of the lower states. I read the the numbers are down, but there seem to be a full, crowded sidewalk of tourists daily and the cruise ships are coming in with full loads, so we're not suffering. Enough said!